There is a nice little stock looking bug outside my office right now with a sweet little roof rack. 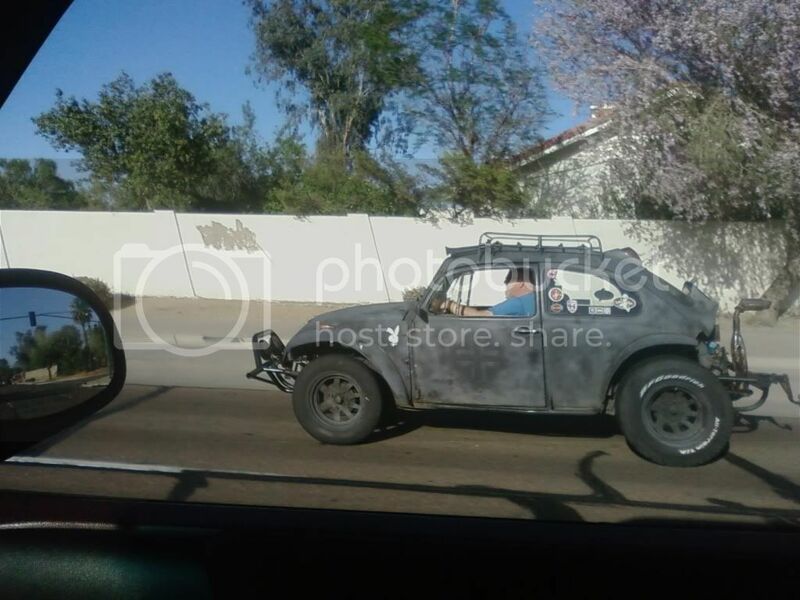 Spotted a very nice looking primer grey baja with 3x3s and black wheels at I-17 and Thunderbird today. Baja at CC and broadway 11 am today. Saw a blue rail and a black rail this morning going to Maricopa, told them to check out our site. Passed a yellow Manx on Rt 66w near Marshall, VA heading to a cook out in the Baja. Looked very clean. Saw this one on 43rd Avenue and about Paradise lane. Took me juicing the 4.0 in my truck a bit to catch up to him since he was doing about 60 and cutting in and out of lanes, but I got him. Haha! looks like they're standard 4-Lug White Spokes that have been painted. i'm not 100% on that but that's what they appear to be. Yeah thats what I was thinking there 8 spoke just cant quite tell comparied to the pic's I see of the white spoke ones >.< thanks tho well at any rate I went ahead and ordered 2 15"x6 and 2 15"x8 white spoke rims from JC Whitney "hope ther the same" Im gonna see if I can find someone local to powdercoat them flat black. Don't forget you need two cans. One can of right and one can of left wheel paint. i think it's by Rust-O-Leum again, not 100% but it should be pretty noticeable on the shelf, should say WHEEL PAINT right on it.